Adobe Flash Player was updated again today to address critical security vulnerabilities. These updates address vulnerabilities currently being exploited in the wild. CVE-2013-0643 and CVE-2013-0648 are being exploited in the wild in targeted attacks designed to trick the user into clicking a link which directs to a website serving malicious Flash (SWF) content. CVE-2013-0643 and CVE-2013-0648 are designed to target Flash Player in Firefox. 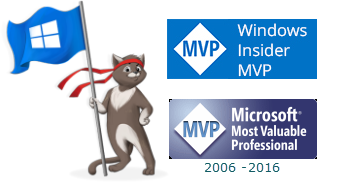 I hope Security Garden readers haven't missed the message from the Windows Live Mesh and SkyDrive Teams announcing the retirement of Mesh earlier this month. Remote desktop and peer-to-peer sync are no longer be available. Synced folders have stopped syncing. You are no longer able to connect to your PCs remotely using Mesh. Whether you are a former Windows Live Mesh user or just never tried SkyDrive, you will discover that it is very easy to set up. 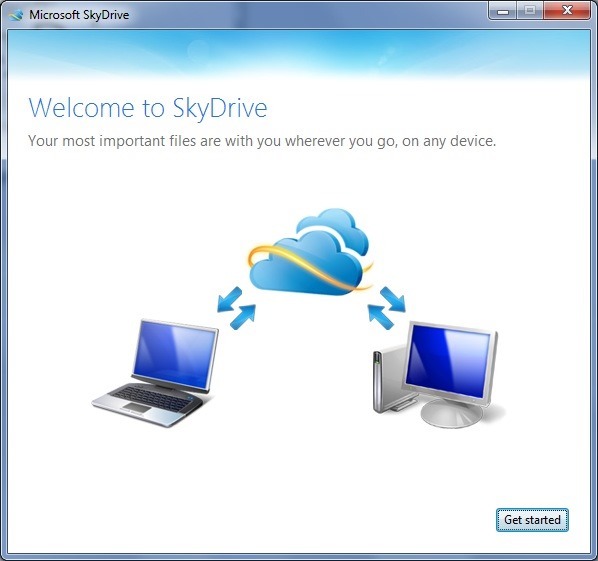 SkyDrive works on Windows 8, Windows 7, or Vista, and Mac OS X Lion computers. Setting up SkyDrive couldn't be easier. Double-click SkyDriveSetup to start the installation. Click the Getting Started link on the Wizard that launches after installation. Sign in with your Microsoft Account. If you don't have a Microsoft Account yet, just click the link to sign up. 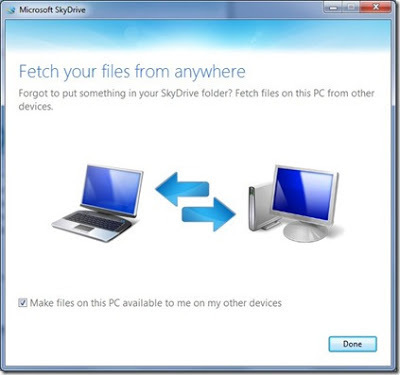 Click Next and you have the option to change the location of the Skydrive folder, although you may want to stay with the default. As appropriate, check the box to "Make files on this PC available to me on my other devices" and then click Done. All you need to do to get started is drag the files and folders to your new SkyDrive folder and the application does the rest! Now you can easily access your files from another computer or device. With 7 GB of free storage, you have enough space for 20,000 Office documents or 7,000 photos. It was one year ago today that hosting and vBulletin 4 software license were purchased by site owner and fellow Microsoft MVP John Griffith, for the express purpose of BSOD App development at Sysnative.com. 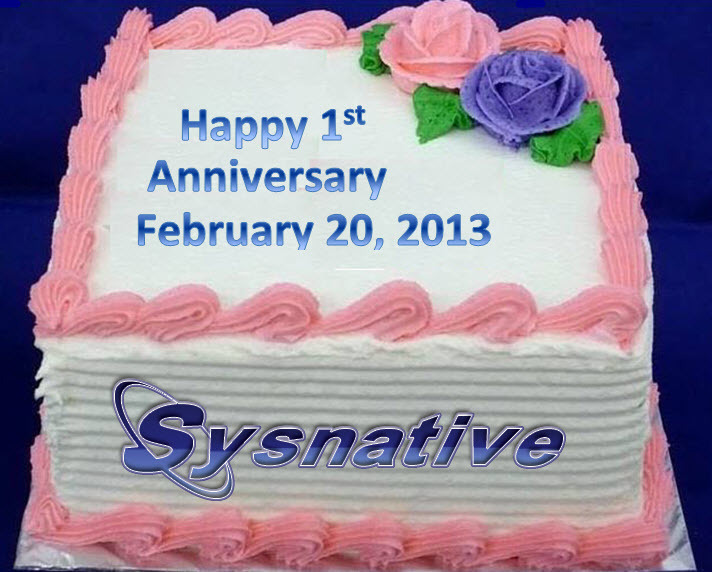 A year later and not only was the goal of further development of the Sysnative BSOD App achieved (and ongoing), but also Sysnative has grown into a full-fledged support forum. A wonderful and talented group of people have contributed to making Sysnative a wonderful place to both provide and obtain help. If you need help, would like to learn more about analyzing BSOD's or see the amazing work being done solving Windows Update and other computer problems, join us at Sysnative.com! Membership and help are free. Only registration is required. To get a taste for the wide range of areas covered, see Lots of help here...this tells you where to find it. Additional information: Sysnative - What is it? Following the release of Security Advisory (APSA13-02) related to critical security vulnerabilities in Adobe Reader and Acrobat XI (11.0.01 and earlier), X (10.1.5 and earlier) and 9.5.3 and earlier for Windows and Macintosh, Adobe released an update to those versions today. When Oracle released an out-of-band security update for Java SE, additional updates that had been planned were not included. As a result, this critical security update was released to add the additional five fixes omitted earlier this month. In an surprising move, Oracle has added two additional dates to the update schedule in order to further accelerate Java security fixes. Firefox 19.0.0 was sent to the release channel today by Mozilla. Although the release includes the usual long list of bug fixes, the release does not include security updates. 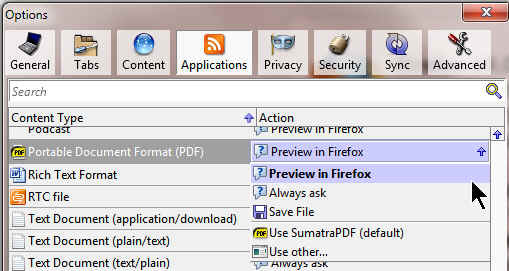 Firefox 19 does include a new addition, a built-in PDF viewer. It is important to note that the addition is just that, a viewer. It is not possible, for example, to use it for completing fill-in forms. However, when using the viewer, the option is available in the right-hand corner of the viewed file to "Open with a Different Viewer". As illustrated below, the built-in .PDF reader can be enabled or disabled via the Tools > Options > Applications tab. To select Firefox for viewing the file, navigate to where you have Firefox installed on your computer; i.e., C:\Program Files (x86)\Mozilla Firefox\Firefox.exe and select it. The PDF will then be viewable in Firefox. When the PDF is opened in the built-in PDF viewer there may be a warning in the message bar reading, "This PDF document might not be displaying properly". It is at this point where you can elect to openthe file with a different viewer. The Release Notes include additional changes and fixed features in version 19.0. For a complete note of all fixes, see the Bug Fixes in the link below in References. Following the recent critical security advisory for Adobe Reader, questions have been raised in forums about an alternate PDF software program. Although I provide security update information about Adobe Reader, I uninstalled it several years ago. I switched to the open source software program SumatraPDF. 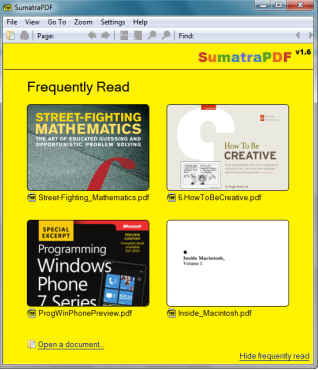 SumatraPDF is a free PDF, eBook (ePub, Mobi), XPS, DjVu, CHM, Comic Book (CBZ and CBR) reader for Windows, created by Krzysztof Kowalczyk. 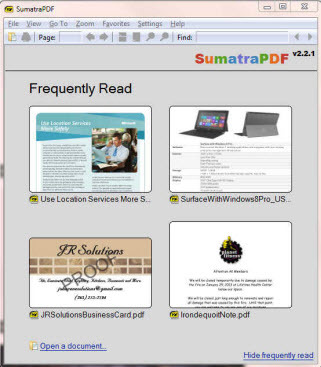 The most recent update added support for FictionBook e-book format as well as support for PDF documents encrypted with Acrobat X.
I selected SumatraPDF because it has a small footprint, has no added toolbars and is not a target of malware writers. 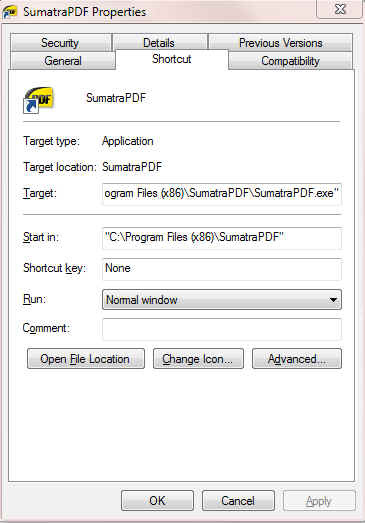 Although I indicated that SumatraPDF is not a target of malware writers like we have seen lately with Adobe Reader, that does not mean that the normal cautions should be thrown away. A SumatraPDF feature I particularly like is that you can select text or an image and copy it. I have not had any problems opening PDF files at sites that specify "Adobe Reader Required". Someone mentioned that they heard there is a problem printing from SumatraPDF. My five year old printer has no problems printing from PDF files from Sumatra PDF. One comment about SumatraPDF is that many people do not care for the bright yellow background. If you don't like the yellow background, it can be changed to the color of your choice. The first thing you need to do is to select the color you want to use to replace the yellow. There is a simple chart to select a color on this color chart or this list of color codes. Another source for selecting colors is available here. Locate the SumatraPDF shortcut in Windows' Start menu. If you prefer, this can be done via Command Prompt. Right-click cmd.exe and select "Run as Administrator". Change the path to Sumatra and add the change as shown below. SumatraPDF does not support Windows 8, which has a built in PDF reader. The currently supported operating systems are Windows 7, Windows Vista, and Windows XP. Adobe released Security Advisory (APSA13-02) related to critical security vulnerabilities in Adobe Reader and Acrobat XI (11.0.01 and earlier), X (10.1.5 and earlier) and 9.5.3 and earlier for Windows and Macintosh. Adobe reported that the vulnerabilities are being exploited in the wild in targeted attacks designed to trick Windows users into clicking on a malicious PDF file delivered in an email message. These vulnerabilities could cause the application to crash and potentially allow an attacker to take control of the affected system. Both Windows and Macintosh operating systems are vulnerable, however mitigation is only provided for users of Adobe Reader XI and Acrobat XI for Windows. 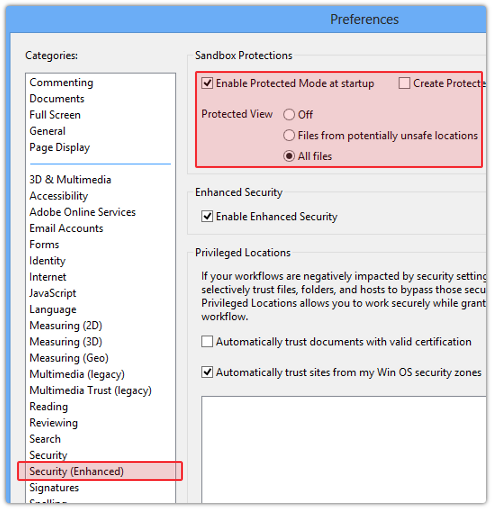 In order to minimize vulnerability it is recommended Windows users of Adobe Reader and Acrobat ensure that Protected View is enabled. Unfortunately, neither the Protected Mode or Protected View option is available for Macintosh users. If you haven't updated to the latest version of Adobe Reader it is strongly advised that you do so and enable the settings as illustrated above. 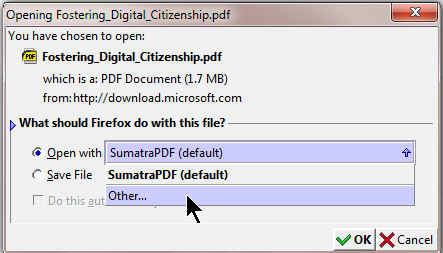 On other hand, if you are looking for a replacement for Adobe Reader, consider Replacing Adobe Reader with Sumatra PDF. Although a critical security update was released for Adobe Flash Player just last week, yet another critical security update has been released today. The updates released are for Adobe Flash Player, Adobe AIR and Adobe Shockwave Player. Details and update instructions are included below. Adobe Flash Player was again updated to address critical security vulnerabilities. These updates address vulnerabilities that could cause a crash and potentially allow an attacker to take control of the affected system. For Adobe AIR see Determine version | Adobe AIR runtime. The update to Adobe Shockwave Player for both Windows and Macintosh systems addresses vulnerabilities that could allow an attacker, who successfully exploits these vulnerabilities, to run malicious code on the affected system. The newest version of Shockwave Player 12.0.0.112 is available here: http://get.adobe.com/shockwave/. Please remember to uncheck any unwanted 3rd party toolbars or other programs during installation. To test the Adobe Shockwave Player installation on your computer, go to the Test Authorware Web Player page. Microsoft released twelve (12) bulletins addressing 57 vulnerabilities in Microsoft Windows, Office, Internet Explorer, Exchange and .NET Framework*. Five bulletins are identified as Critical and seven as Important. *Note: If you have problems with .NET Framework updates, it is recommended that you install this update separately with an shutdown/restart. Adobe Flash Player was updated to address critical security vulnerabilities. These updates address vulnerabilities currently being exploited in the wild. The vulnerability described by CVE-2013-0633 is designed to trick the user into opening a Microsoft Word document delivered as an email attachment which contains malicious Flash (SWF) content. The exploit targets the ActiveX version of Flash Player on Windows. CVE-2013-0634 relates to a buffer overflow vulnerability that could lead to code execution. Attacks are delivered via malicious Flash (SWF) content hosted on websites that target Flash Player in Firefox or Safari on the Macintosh platform. Attacks are also designed to trick Windows users into opening a Microsoft Word document delivered as an email attachment which contains malicious Flash (SWF) content. On Tuesday, February 12, 2013, Microsoft is planning to release twelve (12) bulletins addressing twelve (57) vulnerabilities. Five bulletins are identified as Critical and address vulnerabilities in Microsoft Windows, Internet Explorer and Exchange Software. The seven remaining bulletins are rated Important and will address issues in Microsoft Windows, Office, .NET Framework, and Microsoft Server Software. In the event you have had problems installing .NET Framework updates in the past, please consider installing those updates separately with a shutdown/restart included, regardless of whether or not it is required. Firefox 18.0.2 was sent to the release channel today by Mozilla. Although this update does not include any security updates, the massive list of bug fixes suggests that it is advisable to install this update sooner rather than later. Update: Thanks to a tip from a friend, I discovered that the update to version 18.0.2 added a check to the option to allow 3rd party cookies. If you, like me, do not want to accept 3rd party cookies, you can reverse the change at Firefox > Options > Privacy. View the incredibly long list of Bug Fixes for version 18.0.2 in the link listed below. Safer Internet Day is marking its tenth year in promoting safer and more responsible use of online technology and mobile phones, especially among children and young people across the world. The annual February event is organized by Insafe and co-sponsored by the European Union. The theme for the event this year is "Online rights and responsibilities", with the goal to encourage everyone to Connect With Respect. It is important for parents to ensure that your children understand that after information is made public on the Internet, it cannot be taken back. Be sure they understand the dangers that lurk not only in the form of computer viruses but also child predators. Review the information at How to help your kids use social websites more safely and ensure that household rules are established and followed. As reported by Microsoft, 37% of children indicated in a survey that they have been bullied online. Another 24% admitted that they have bullied someone online. Take a couple of minutes to go through the following quiz which includes five online-bullying scenarios. Follow the "learn more" links for helpful tips on correcting negative and reinforcing positive behaviors. With cyber bullying a continuing problem, parents of youths between the ages of 13-18 are encouraged to point those teenagers to the Microsoft-sponsored Safer Online Teen Challenge. The Teen Challenge is designed to enable teens to learn about online safety issues. It’s a fun way to get creative and talk with others about important digital topics. Take the challenge to make every day a Safer Internet Day for you and your family to Connect With Respect. Additional information about Safer Internet Day is available in the references below. 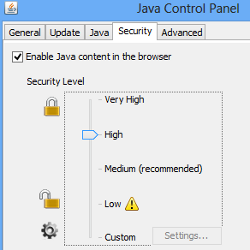 The scheduled February Java critical patch update was accelerated due to active exploitation “in the wild” of one of the vulnerabilities affecting the Java Runtime Environment (JRE) in desktop browsers. The new Java release is Java™ SE Development Kit 7, Update 13 (JDK 7u13), with the full version string for this update release being 1.7.0_13-b20 (where "b" means "build") and the version number is 7u13. If you have uninstalled Java due to recent critical vulnerabilities and have not missed it, my suggestion is to bypass re-installing it until or unless it is needed. See Java, The Never-Ending Saga for additional information on removing or disabling Java. Should there be software programs you use or websites that you visit that require Java, it is strongly advised that the update be applied as soon as possible.